We like to keep our wine selection fresh and new, offering a selection from varietals and appellations across the world. Tasting wine with no preconceived notion or idea of what ‘it should taste like’. And sometimes there are those appellations and varietals that people think they ‘know all too well’ and often avoid them. Merlot anyone? I invite you to challenge these misconceptions with a very special tasting this week. 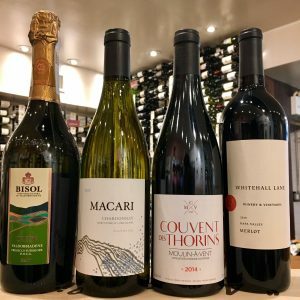 Join us as we challenge naysayers and pour our recent additions, Bisol Prosecco, Macari Chardonnay from Long Island, Couvent des Thorins Moulin a Vent Beaujolais and Whitehall lane Merlot! Thursday March 30th 2017 from 5pm to 8pm. We believe tasting wines side by side is always a great way to learn and appreciate the differences and similarities! 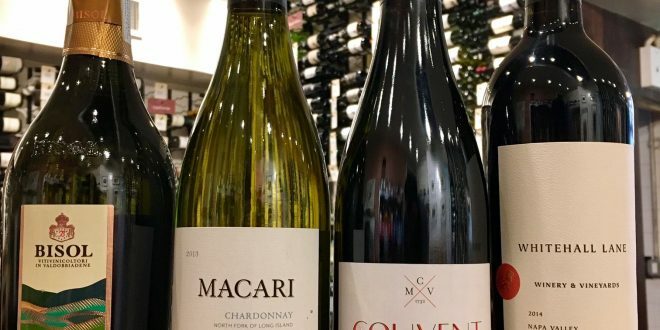 Usually centered on a theme, our complementary tastings run in-store every Thursday from 5pm-8pm. To sweeten the deal, we’ve discount all the wines being poured that day!